The latest news from Facebook spells another blow to the social network’s reputation, but also the untold danger to users’ private information. After a report emerged that an analytics company associated with the Trump campaign and many other political campaigns had mined the data of millions of users’ profiles, Facebook is left attempting to explain how it values users’ privacy. However, it is becoming clear that people must take their protection into their own hands. Facebook is designed to broadcast your private data, as the company can collect it, use it, and sell it without sharing with you. Make sure your information is never exposed again to Facebook or any other online company. Follow these tips and protect yourself from Facebook’s unsafe ecosystem easily and effectively! Many security professionals and industry observers have spent years warning people about the dangers of sharing personal data and details on Facebook and other social networks, but the public recently got a taste of the warnings turned real. A report by the New York Times and The Observer released earlier in March revealed that a company named Cambridge Analytica mined the personal information of 50 million users to assist both the UK’s ‘Brexit’ campaign and the Donald Trump presidential campaign. Although the mining appears to have happened legally, it raises important questions about users’ privacy and their profiles’ safety from third parties on the social network. Individuals who are concerned with protecting their movement online must take action to defend themselves against both companies trying to harvest their data, and Facebook itself. However, it’s not as dire as you think. Protecting your data and identity requires the right tools and vigilance on your part, but you can still browse the web safely in the wake of the Facebook breach. What Happened With Facebook Users’ Profiles? According to a news report from the New York Times and The Observer, a company named Cambridge Analytics spent several years harvesting user profile data from at least 50 million users. Using a quiz application named ‘thisisyourdigitallife’ developed by Global Science Research, the company collected the information of 270,000 people who signed up to use it, as well as their vast network of friends and connections. The company did so without requesting permission from these users, and without ever notifying them their information was being used. It’s important to note that Cambridge Analytica technically did not act against Facebook’s policies, but the social media giant was aware of the situation as early as 2015 and did not do enough in the eyes of many observers. Companies and individuals alike took action and were swift to condemn Facebook. Elon Musk, for instance, was quick to remove all his companies’ pages from Facebook. I didn’t realize there was one. Will do. However, the fact that this information was so easily extracted without users’ acknowledgment or consent raises very serious questions about the platform’s safety, and users should be prepared to take actions to protect themselves. What Does This Mean for Your Personal Information? The news highlights a particularly dangerous and deceptive side effect of Facebook’s constant stream of privacy permissions and application restrictions. Cambridge Analytica and GSR used a loophole in an older version of Facebook’s ecosystem that allowed them to access users’ friends’ data as well as their own profiles to create their database. However, they never actually broke Facebook’s data usage and collection policies. The company used this data to create algorithms that allowed political campaigns to create more targeted content and sway public opinion more easily. For everyday users, it is a stark reminder of how unsafe Facebook and its contemporaries are for individuals on their platforms. The company has not released a list of users affected or notified specific accounts that their data has been used, but it has announced a variety of fixes that theoretically solve the loophole. However, there is evidence Facebook knew about the situation as early as 2015, as well as proof that these vulnerabilities were revealed as early as 2011. Essentially, it means that users may have had their profiles mined by third parties without their consent and even awareness. Moreover, it means there is little way to know if it is the case. Review Your Privacy Settings. The first place you should review is your own Facebook account. Make sure all your settings are set to the most secure configurations and review all the applications you’ve allowed on your account. These all have different collection policies and may be taking more data than you’re aware of. Remove API Sharing Permissions. More than just collecting data on your Facebook profile, the company allows third parties to also access your data if you use your account on their websites. To avoid any situation like this, visit your settings and visit Apps > Websites and Plugins, and click on Disable Platform. Block Online Trackers and Protect Your Browsing. Trackers are small programs that scan your movement through websites and mine your usage data. Most websites feature some tools that do so (such as embedded tweets or Facebook posts). However, there are programs that can block these trackers, and some browsers (such as Firefox) that let users avoid being followed. You can also protect yourself by using some of the best VPNs for Facebook to make sure you’re anonymous when visiting the site. Beware of Unknown Apps and Tools. Don’t accept any invitations from applications you don’t know and avoid granting any permissions to Facebook apps that can collect your user information. This will help reduce your footprint online. Delete Your Account. If all else fails and you feel it’s unacceptable that Facebook still has access to your data, you can move to suspend, or even delete your account. You can deactivate your account if you may want to rejoin the network in the future, or you can fully remove it and delete all your data. You can download a copy of your Facebook data and archive it, and then make sure it’s what you want as the action can’t be undone. 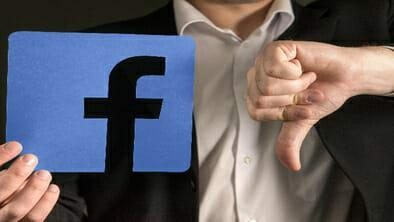 Facebook broke its users’ trust when it allowed such a massive data harvesting operation without notifying its users. The company is under fire, and its market capitalization has been steadily declining since the report was published. Mark Zuckerberg’s long-winded apology, in which he vowed that “You deserve to have your information protected — and we’ll keep working to make sure you feel safe on Facebook” rings hollow given the scope and ease of the data breach. You can still connect with your friends and loved ones online, but you shouldn’t trust a major corporation to look after you. Instead, you can be proactive and protect yourself while still enjoying the web and your online freedom. < Previous Is What You're Looking at Considered an 'Acceptable' Ad? Is Your Flashlight App Doing More Than Lighting Up Your Room?